I have been working on different ways to represent overlay networks in reports, presentations and consulting engagements. 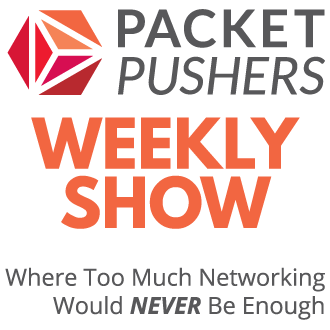 At this point, I have something workable that I can share with you. 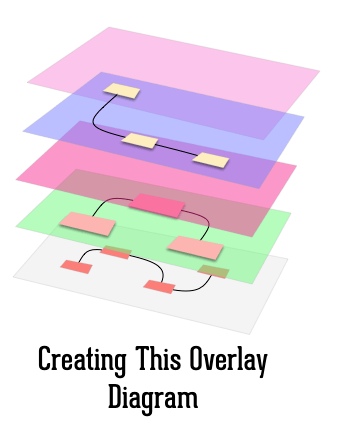 Here is the diagram I’m going to produce using OmniGraffle 6. 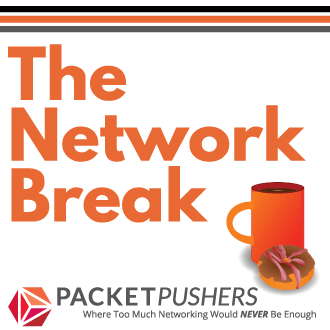 I guess you could create network diagrams like this in Visio but I don’t use it because it’s unreliable. I hate losing work. The key to this diagram is that is has perspective to a vanishing point. 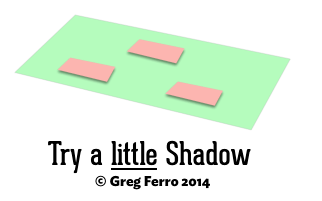 Easy to do this is to draw two lines to some point, draw a rectangle, then Edit, Shapes, Editable Shape will give you small blue handles to drag around. Move them to make this shape. The actual shape doesn’t matter too much because duplicating the shape here means that all of the shapes in the ‘stack’ are roughly the same. Do your best to copy what I’ve done here and it should be good. 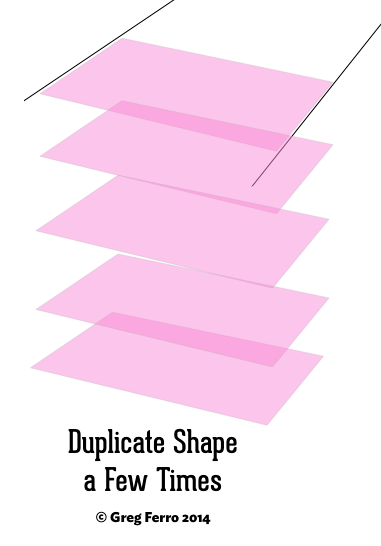 Duplicate a bunch of shapes. Then distribute them evenly use the appropriate tools. 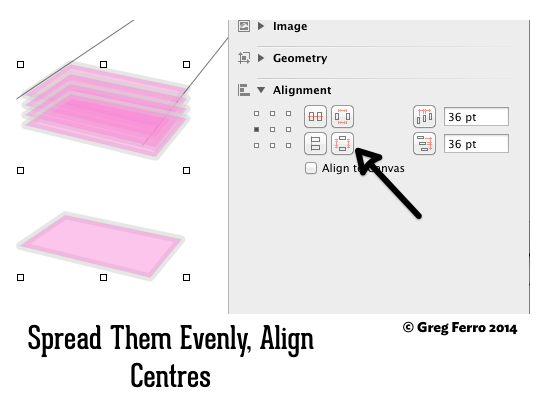 This is the Inspector bar in Omnigraffle showing how to align the object centres vertically and to evenly distribute over a given area. 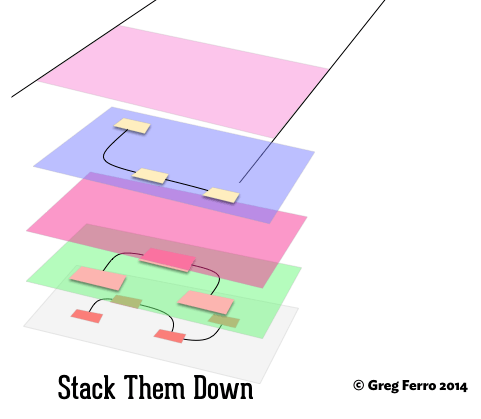 Then change the colours of each shape element in the stack. Ok, so choosing colours is hard and you probably don’t know how to use a colour wheel (neither do I but I’m working on it). 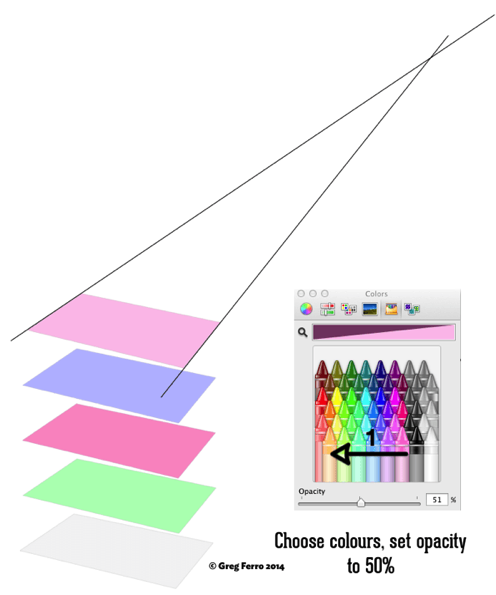 Here I’ve chosen a colour on the bottom row of the OS X Colour picker and each layer is the next colour along. I’ve also set each colour to 50% opacity so that you “see” through the layers. The shapes lack coherence when you look at them. They don’t look right, or somehow they are aren’t straight. 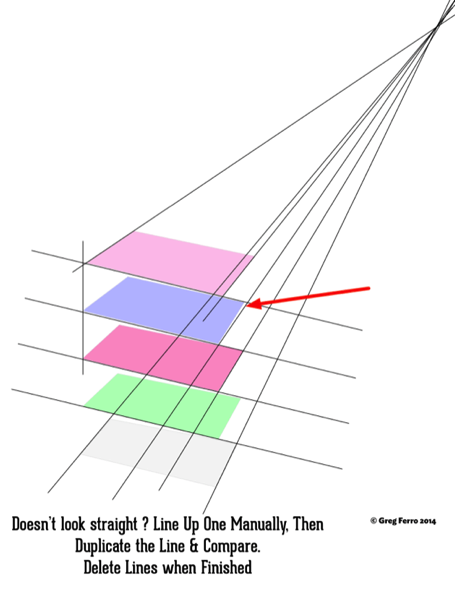 That’s because the shapes don’t converge on the same vanishing point. 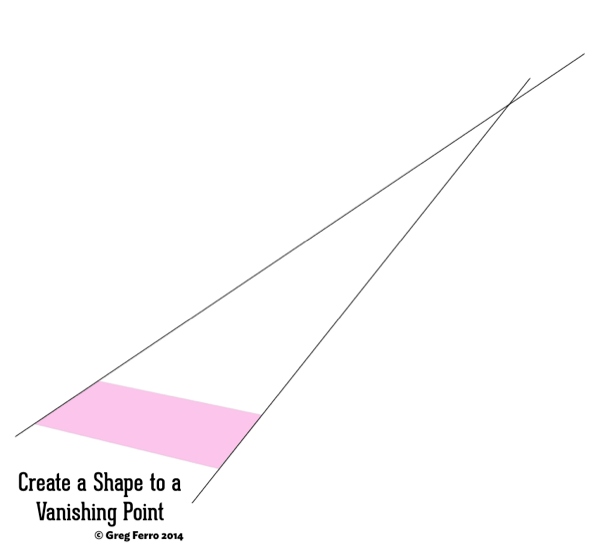 The next diagram shows how to add a couple of lines to vanishing point, then using editable points in the shapes to line them up. Don’t be shy to add more lines to keep everything aligned. See how the purple shape layer isn’t quite straight ? Adding a line will keep that sorted out. 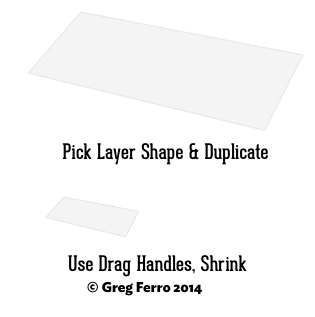 Resize it using the corner shape handles so that it keeps the same proportions. 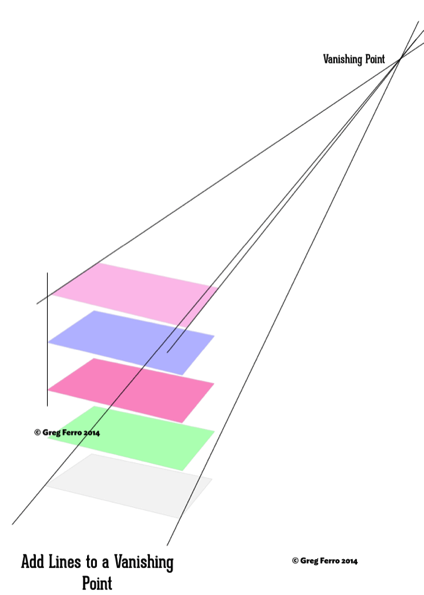 In Omnigraffle, hit the ⌥ key will resizing with the mouse. 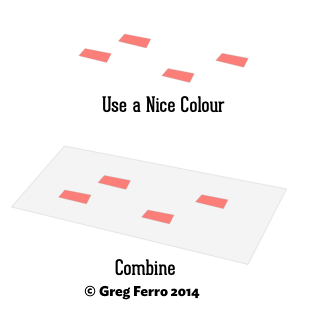 Change the shapes to a nice colour that will contrast against the layer. (OK, so I am not an interior decorator) and then drag it on to the shape. 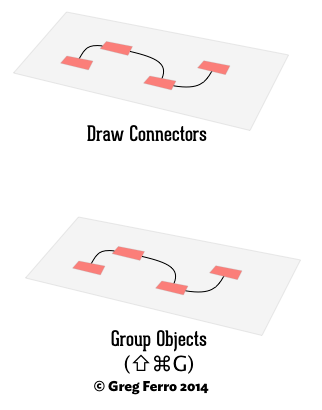 Draw some connections like this and then use the “Group” function to make single object. This makes it much easier to move around, align & centre in the following steps. Sometimes it’s worth using a little shadow to create the contrast. The colours are dreadful here (why did I put puce on emerald ? ) but you can see the improvement created. Now we can bring the layers back together. Align centres, and distribute them evenly again. 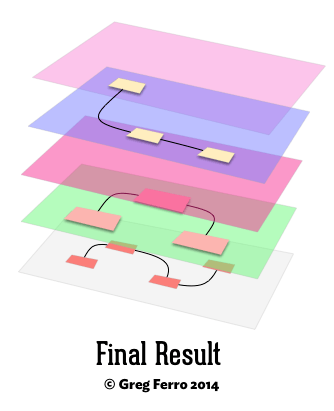 And now you have the final result of an aesthetically pleasing overlay network diagram. Ok. So it is a work in progress. I’ll get the colour and shapes better in the next version. This is so incredibly useful and beautiful looking. Many thanks!